David enjoys performing his amazing magical repertoire at weddings in and around the town of Daventry. David is available to perform his magic at venues in and around Daventry and also in the comfort of your own home. Magician David Fox will add that special spark to your corporate event making it day everyone will remember fondly. 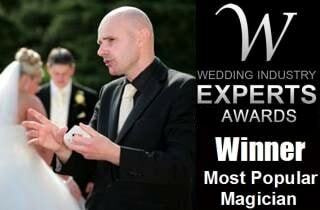 Daventry magician David Fox is ready to amaze you and your guests! 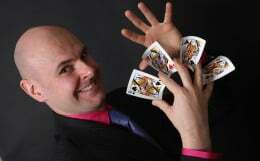 For special red letter days in and around the Daventry area, contact Northamptonshire magician David Fox today. Whether you are planning your wedding, or simply organising a family get together, David's magic is truly breath-taking. At a recent wedding reception at Dodford Manor, David stole the show by performing wonderful card magic, mind-reading routines and classic illusions throughout the early part of the reception. For more details why not send the Daventry man of magic an email today or drop him a quick text message?